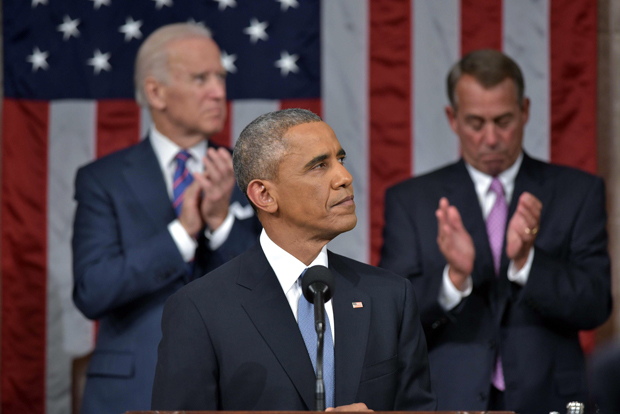 President Barack Obama arrives for the State of the Union address on January 20, 2015 in the House Chamber of the U.S. Capitol in Washington, DC. It was his sixth State of the Union speech, but his first with both houses of Congress in Republican control: On Tuesday night, President Barack Obama forcefully detailed the accomplishments of his presidency and his commitment to raising the economic prospects of middle class Americans. He also promised to seek out the ideas of Republicans and to work with them to “make this country stronger,” but there was no sign in the Republican response that political compromise is on the table. Please join us for reaction to the president’s State of the Union address and congressional priorities going forward. David Winston Republican strategist, president of the Winston Group and CBS News consultant. He has served as an adviser to the House and Senate Republican leadership for more than a decade. E.J. Dionne Jr. Senior fellow, Brookings Institution; columnist for The Washington Post; and author of "Our Divided Political Heart: The Battle for the American Idea in an Age of Discontent." Carol Lee White House correspondent, The Wall Street Journal.